Local businesses have it rough. Not only do they typically lack the financial backing that national businesses have, but they also are focused on a more limited target market than their national counterparts. Aside from competing with large national brands, you have to compete against other local businesses. So what do you need to know to position your business to get the exposure it needs? Implementing a local SEO strategy is a great way to keep your business competitive online. Over the past few months, Google has been focusing more on local search results by incorporating Places results into organic search results. Making sure you utilize local SEO best practices will help the chances your business will appear in one of these spots on page 1. By implementing local SEO best practices, your business can beat out larger counterparts on search engine results pages, or SERPs. In the screenshot below, one local pizza company in Gainesville ranks higher than national chains that have multiple locations in the same city. Creating a local SEO strategy can help your business achieve the same results. 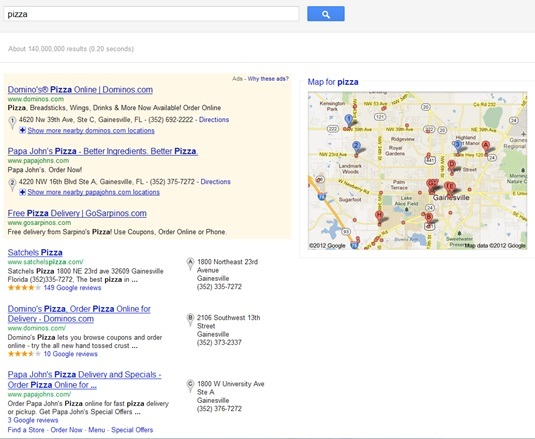 One of the first things you should do is set up your business’s Google Places page. Enter in as much information about your business as possible, including your address, phone number, and link to your website. Also include some of your business’s keywords into your description and some images or your business’s logo. When you enter in your address and phone number, take note of exactly how you enter in that information. Is your address on SW 140th Road, or did you change it to SW 140th Rd? It’s going to be important for all your citations to be consistent, so make sure you remember whether you spelled your street name out or if you used an abbreviation. Did you include a suite or room number, or did you just provide the street address? Did you include your phone line’s extension, or just the main number? Keep all these factors in mind, and make sure your citations are consistent anywhere you include them online. Once you set up your Places page in Google, you’ll receive a postcard a few weeks later with a PIN. This number will help Google verify that your business is indeed a physical address and that you have the authority to manage the Places page. It usually takes two to three weeks to receive the postcard, but you can begin adding citations while you’re waiting on Google verification. Citations are going to be a huge component of your local SEO strategy. This article from Search Engine Land provides a long list of websites that allow you to list your business for free, and there’s a list on Powered By Search of additional websites you can use to gain local citations. When entering your information on these websites, remember that consistency is key. Make sure you’re entering your business location exactly as you entered it into your Google Places description, and include some of your keywords in your business description. You don’t want to make your description the exact same on each citation for fear of the listing looking spammy, so vary your business description for each listing. While it takes longer than just copying and pasting from one website to another, the benefits will be worth it. You’ll also want to see if any local directories or newspapers will allow you to list your business on their websites. Most papers have online counterparts now, so see if you can get listed in their online directory. If you are hosting any events in the future, see if you can include them on an online calendar. This will give you an additional place to list your business, your contact information, and maybe a link back to your website. Whitespark also features a great citation finder tool that we use at 352 Media Group. It is a huge time saver, and they have various packages your business can use. If you are only using this tool for one business, you should be fine with the free service, but if you have multiple locations throughout a state, you might choose the small business package that runs $20 a month. If you know you have a lot of local competition, say if you are a dentistry office, you can use Google to see where your competition has citations. First, look up your competition’s phone number. Then, search for that phone number in Google and see where that business has listings. Add a listing for your business on this website as well. This will help you stay competitive with other local businesses in your industry. 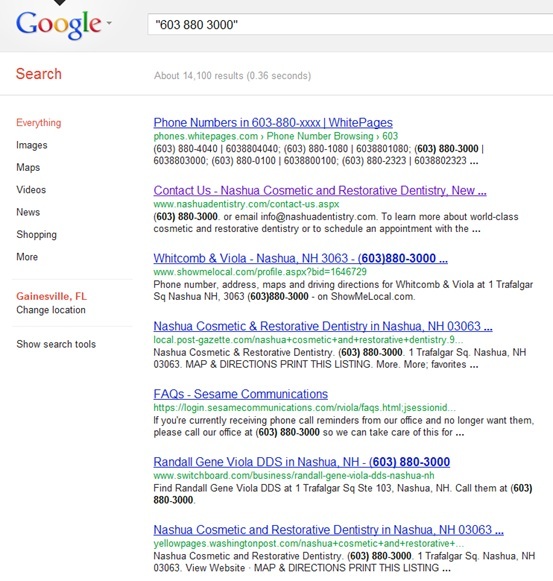 By searching according to phone number, we can see where this local dentistry office has obtained citations. You’d want to list your business on these sites as well. Cues from social media sites such as Facebook, Twitter, Foursquare, and Google+ are factoring into search result listings, so it’s important to feature your information on these websites as well. List your business’s contact information on all these sites, as well as a link to your business’s website. You can also search for local blogs that cover your industry. For example, if you own a local limo company, look for bridal blogs that have a local counterpart and ask if you can write a guest post about wedding day transportation. Search for “city name + blog” and see if any of the blog results would be a good outlet for a guest post. All of these tips are a good primer to start on your local SEO strategy, but make sure you are keeping up with your SEO efforts. Digital marketing isn’t a short-term project; you’ll need to keep adding links back to your website through these local citations and other link building efforts to make sure your business gets to the top of the search results and stays there. Amy Moczynski is the marketing associate for 352 Media Group’s small business Web design division, handling all their small business marketing services. You can follow her on Twitter @amymoczynski.